An inside look: row, go, crew! 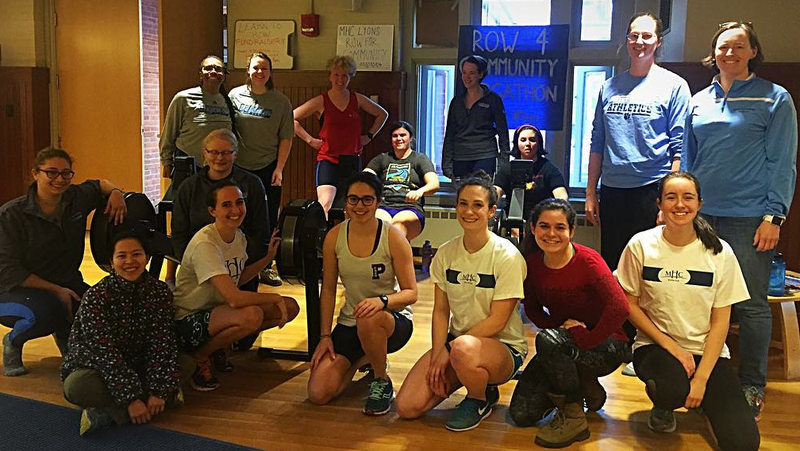 In February 2017, you may have spotted members of the Mount Holyoke College rowing team erging for 12 hours in Blanchard Campus Center. We’ll repeat again for emphasis: erging for 12 hours. Their goal was to row 400,000 meters — and to raise funds for both Neighbors Helping Neighbors, a South Hadley food bank, and their team’s March training trip to Clemson, South Carolina. They even offered free rowing lessons to other students. Zoe Zelkowitz ’19, a double major in economics and history from Scarsdale, New York, chronicled her team’s epic ergathon via an Instagram takeover. As a coxswain, Zelkowitz steers her team’s boat and acts as the on-the-water coach. In the Storify below, she steers us behind the scenes of her team’s fundraiser as we catch a glimpse (not a crab) of the world of Mount Holyoke rowers.